Arudra Engineers offers a wide variety of chemical cleaning and maintenance services for pipelines, condensers, and heat exchangers in power generators across Asia. Arudra specialises in preoperational acid pickling, passivation, and also post-operational cleaning on a turnkey basis to improve the efficiency of boilers and condensers in power plants. Our scope includes mobilising pump skids of various capacities from our large inventory, as well as associated valves and piping. In addition, Arudra is also able to temporarily mobilise boilers and heating systems to reach required temperatures during the cleaning process. Post-operational cleaning services include in-house testing facilities for undertaking qualitative and quantitative analysis of deposits, as well as cleaning exercises used to select the solvent best suited to our clients’ needs. In addition, Arudra Engineers is an authorised applicator for Plastocor International erosion and corrosion protective coatings and repair systems. In 2012 Arudra entered in to the business of decoking furnaces using the pigging method. Arudra is equipped with two double pumper units, which feature Waterous CMU pumps driven by Volvo Penta engines with a flow rate of 1,000GPM at 40 bar pressure. The equipment was supplied by Dutch company Intertech Mechanical BV. The company also extended a comprehensive training programme to Arudra’s technical team. Over the past two years Arudra has successfully executed furnace decoking jobs for a number of refineries in India. Many of the jobs have been executed by the company’s experienced and talented team. Today Arudra has sufficient expertise to carry out furnace decoking jobs effectively and independently. In addition, a subsidiary of Arudra’s parent group IGP is a leading manufacturer of pigs in Chennai, India, which allows Arudra to offer a sufficient stock of various types and sizes of pigs at all times. Dry ice-blasting is a form of abrasive blasting, where dry ice, the solid form of carbon dioxide, is accelerated in a pressurized air stream and directed at a surface in order to clean it. The method is similar to other forms of abrasive blasting, such as sand blasting, plastic bead blasting, and soda blasting, but substitutes dry ice as the blasting medium. This method leaves no chemical residue as dry ice sublimates at room temperature. Dry-ice blasting involves propelling pellets at extremely high speeds. The actual dry-ice pellets are quite soft, and much less dense than other materials used in blast-cleaning, such as sand and plastic pellets. Upon impact, the pellet sublimates almost immediately, transferring minimal kinetic energy to the surface on impact and producing minimal abrasion. The sublimation process absorbs a large volume of heat from the surface, producing shear stresses due to thermal shock. This is believed to improve cleaning as the top layer of dirt or contaminant can transfer more heat than the underlying substrate and flake off more easily. 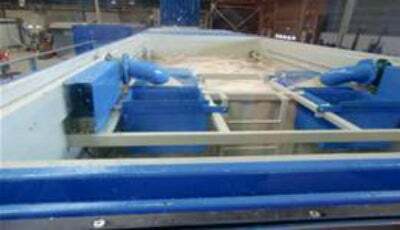 The efficiency and effectiveness of this process depends on the thermal conductivity of the substrate and contaminant. The rapid change in state from solid to gas also causes microscopic shock waves, which can assist in removing the contaminant. Arudra Engineers is an ISO 9001:2008 certified company. It is a member of the IGP group, based in Chennai, India, which has revenue in excess of $80m. The company has undertaken cleaning for all major Boiler manufacturers, including L&T – MHI, Doosan, Dongfang, Shanghai, Siemens, Stone, and Webstar. Recently, Arudra worked as a sub-contractor for Heavy Engineering Industries and Shipbuilding Company (HEISCO), Kuwait, providing technical support for post chemical cleaning of 40 boilers for MEW. Arudra Engineers Pvt Ltd , Chennai, has secured an order for chemical cleaning and steam blowing services for two 660MW super-critical boilers at NCC (formerly Nagarjuna Construction Company Limited), Thermal Power Project in Krishnapatnam, the port city of India. Xina Solar One is a 100MW thermosolar power plant currently under construction near Pofadder, Northern Cape Province, South Africa. AES-VCM Mong Duong Power Company, a joint venture between AES Corporation (51%), Posco Energy (30%) and China Investment Corporation (19%), developed the 1,240MW Mong Duong-2 (MD2) coal-fired thermal power plant in the Quang Ninh Province of Vietnam. Arudra Engineers awarded chemical cleaning orders for Kudgi Power Plant. Arudra Engineers has secured orders from Doosan and Toshiba to perform the chemical cleaning works for boilers and pre-boiler systems in three 800MW units in the Kudgi power plant.